On the 21st (Fri), appreciate the extensive heritage of Inner Harbour. Here are some ideas for day two: browse the exhibits of Victoria Butterfly Gardens and then step into the grandiose world of Craigdarroch Castle. For more things to do, photos, maps, and more tourist information, read our Victoria trip itinerary builder app . Goiania, Brazil to Victoria is an approximately 25-hour flight. Traveling from Goiania to Victoria, you'll gain 5 hours due to the time zone difference. Traveling from Goiania in June, things will get little chillier in Victoria: highs are around 20°C and lows about 13°C. Wrap up your sightseeing on the 22nd (Sat) to allow time to travel to Yoho National Park. Get some historical perspective at Yaletown and Britannia Mine Museum. 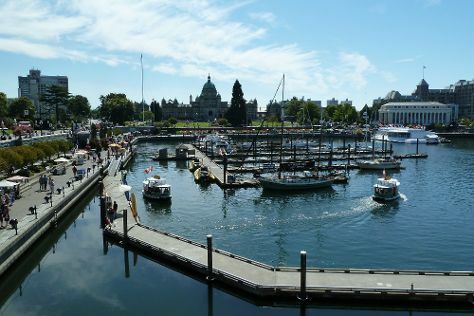 Your cultural itinerary includes sights like Granville Island and Lighthouse Park. Get out of town with these interesting Vancouver side-trips: Richmond (International Buddhist Society (Buddhist Temple), Gulf of Georgia Cannery National Historic Site, & more). The adventure continues: take in the awesome beauty at Grouse Mountain, explore the world behind art at Museum of Anthropology, admire all the interesting features of Capilano Suspension Bridge Park, and take a stroll through Gastown. To see maps, ratings, photos, and tourist information, refer to the Vancouver tour planning site . Traveling by flight from Victoria to Vancouver takes an hour. Alternatively, you can ride a ferry; or do a combination of ferry and car. Expect a daytime high around 24°C in June, and nighttime lows around 15°C. Wrap up your sightseeing on the 28th (Fri) to allow time to travel back home.